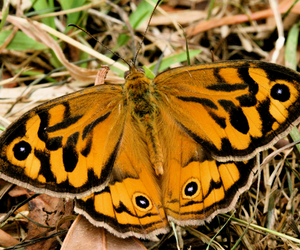 The Common brown butterfly is orange with a dark brown pattern on its wings. The female butterfly has creamy yellow and dark brown patches on the tips of its outer wings. The male butterfly isn't as colourful as it doesn't have the creamy yellow patches. Both male and female have a small eye-spot on each wing. They can be difficult to identify when they are resting with their wings closed as their hind wings have few markings. Common brown butterflies live in forests, urban areas and grasslands. They are often seen in Boroondara's parks along the Yarra River Corridor as well as in Maranoa Gardens and Glen Iris Wetlands. Avoid using chemical sprays and insecticides in your garden as these kill the Common brown caterpillars. You can make your garden butterfly-friendly by making it organic and planting open flowers to enable the Common brown butterfly to land and feed.